Property Location Located in Miami Beach (South Beach), Loews Miami Beach Hotel – South Beach is minutes from New World Center and Española Way. This 4. 5-star hotel is within close proximity of Fillmore Miami Beach and Miami Beach City Hall. Rooms Make yourself at home in one of the 790 air-conditioned rooms featuring iPod docking stations and flat-screen televisions. Your pillowtop bed comes with down comforters and Frette Italian sheets. Complimentary wired and wireless Internet access keeps you connected, and cable programming provides entertainment. Private bathrooms have complimentary toiletries and hair dryers. Amenities Pamper yourself with a visit to the spa, which offers massages, body treatments, and facials. You're sure to appreciate the recreational amenities, which include 2 spa tubs, a health club, and a sauna. Additional features at this Art Deco hotel include complimentary wireless Internet access, babysitting/childcare (surcharge), and gift shops/newsstands. Dining Enjoy a meal at one of the hotel's dining establishments, which include 4 restaurants and a coffee shop/café. From your room, you can also access 24-hour room service. Relax with a refreshing drink from a poolside bar or one of the 2 bars/lounges. Cooked-to-order breakfasts are available daily for a fee. Business, Other Amenities Featured amenities include complimentary wired Internet access, a business center, and limo/town car service. Planning an event in Miami Beach? This hotel has 65000 square feet (6039 square meters) of space consisting of conference space and meeting rooms. 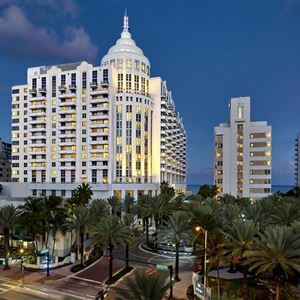 Located in Miami Beach (South Beach), Loews Miami Beach Hotel – South Beach is minutes from New World Center and Española Way. This 4. 5-star hotel is within close proximity of Fillmore Miami Beach and Miami Beach City Hall. Make yourself at home in one of the 790 air-conditioned rooms featuring iPod docking stations and flat-screen televisions. Your pillowtop bed comes with down comforters and Frette Italian sheets. Complimentary wired and wireless Internet access keeps you connected, and cable programming provides entertainment. Private bathrooms have complimentary toiletries and hair dryers. Pamper yourself with a visit to the spa, which offers massages, body treatments, and facials. You're sure to appreciate the recreational amenities, which include 2 spa tubs, a health club, and a sauna. Additional features at this Art Deco hotel include complimentary wireless Internet access, babysitting/childcare (surcharge), and gift shops/newsstands. Enjoy a meal at one of the hotel's dining establishments, which include 4 restaurants and a coffee shop/café. From your room, you can also access 24-hour room service. Relax with a refreshing drink from a poolside bar or one of the 2 bars/lounges. Cooked-to-order breakfasts are available daily for a fee. Featured amenities include complimentary wired Internet access, a business center, and limo/town car service. Planning an event in Miami Beach? 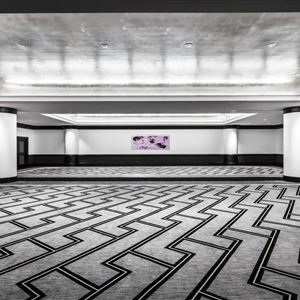 This hotel has 65000 square feet (6039 square meters) of space consisting of conference space and meeting rooms.